On Saturday morning, February 4th I hopped the Metra train and traveled 90 minutes south to Union Station in downtown Chicago. Waiting for me at a little cafe for breakfast was my friend Wendy Piersall, author of Mom Blogging For Dummies and owner of Vintage Fan Girl. I had received an invitation to visit the Randolph Street Market and I knew Wendy, with her love for all things vintage and antique, would be the perfect blogging buddy to make the trip with me. 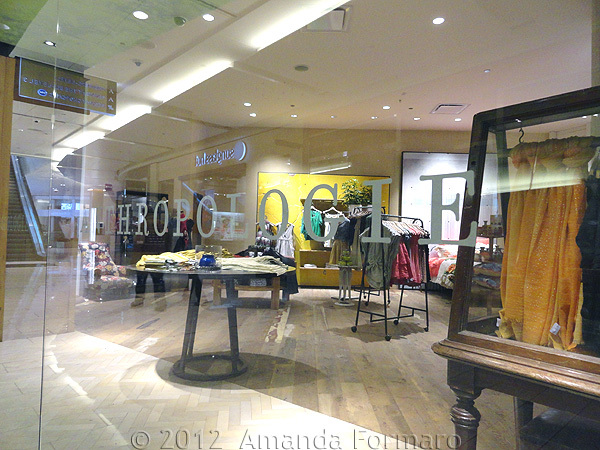 Wendy and I had a little time to kill between breakfast and the market, so we hit Anthropologie. That’s a whole separate post all in itself. I’ll share those pictures soon! After perusing Anthro, we headed for Plumbers Hall. If you are anywhere near the Chicago area and you love antiquing or even junking, this is a great day trip you won’t want to miss. 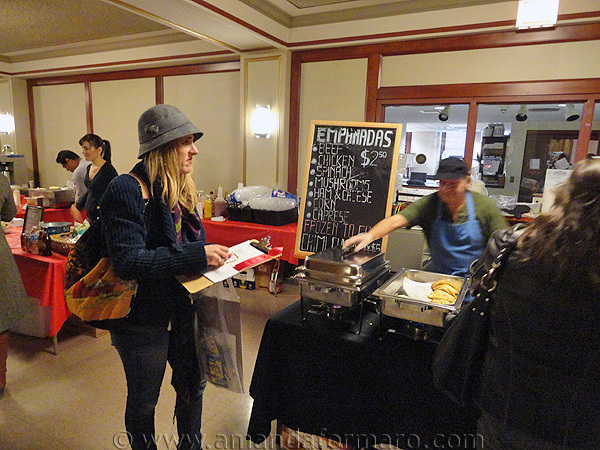 February’s market, held at Plumber’s Hall on Washington Boulevard at Randolph Street in the heart of a historic West Loop neighborhood, kicked off the 2012 season. 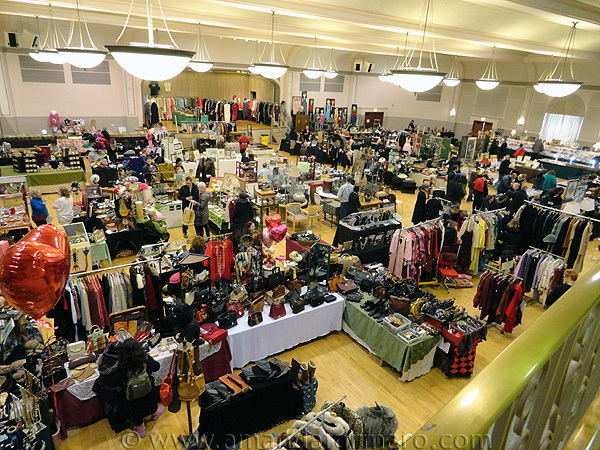 The winter markets are held indoors but still draw hundreds of eager buyers and plenty of unique vendors. The schedule of dates is marked clearly on their website, but if you’re looking to hit the next one, you can browse with the rest of the crowd on March 24th and 25th. The winter markets, while amazing in their own right, are just a teaser for the summer festivals. While Plumbers Hall is quite expansive, offering an upper and lower level jam packed with antique items for your perusal, the market itself is 3-4 times larger in the summer as it sprawls outdoors into the enormous parking area. 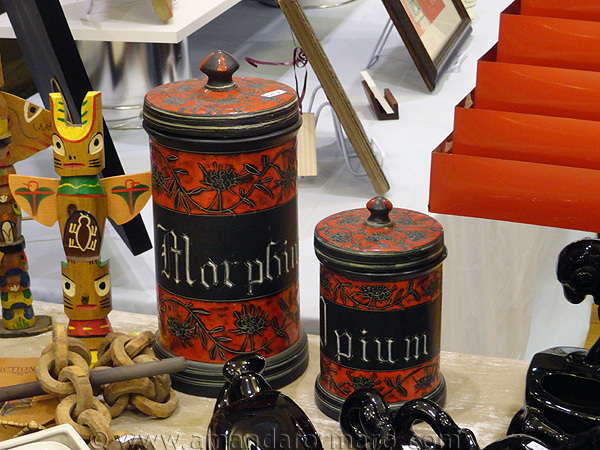 Oh and wait, did I mention that the Randolph Street Market Festival is also home to the Chicago Antique Market, the Indie Designer Market, Modern Vintage Chicago as well as the Holiday Market? There’s just way too much to mention, you’ll definitely want to browse their website and see all they have to offer. 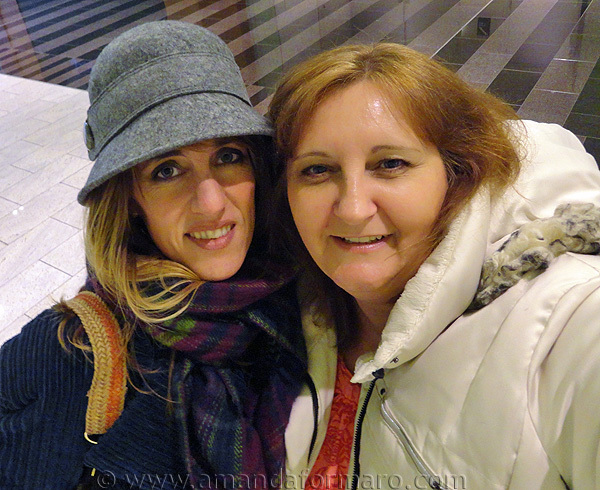 So what did Wendy and I discover during our visit? Far too much to even mention, but let me give you some highlights. I know a lot of crafters and DIYers who would like to get their hands on this beautiful piece! All of the doors on this antique post office box are in tact. This beauty was offered in the vendor booth “Revival”. You aren’t seeing things. Those canisters say Morphine and Opium. That’s right. Back in the day pharmacies would keep medicines in containers such as these and measure out what was needed for each patient/customer. Look at that velvety purple beauty. 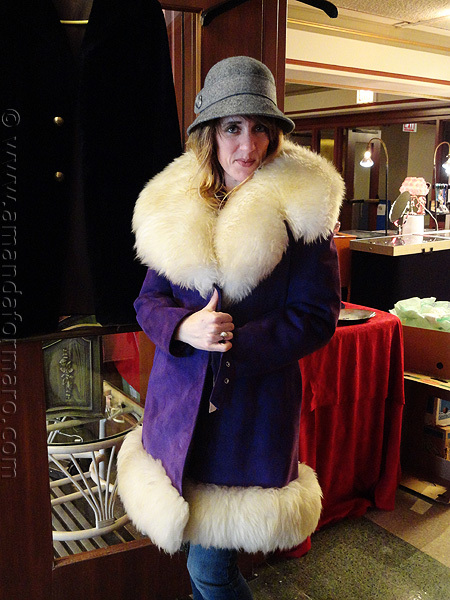 While it was too small for me, Wendy was kind enough to model this beautiful vintage coat for all of you. 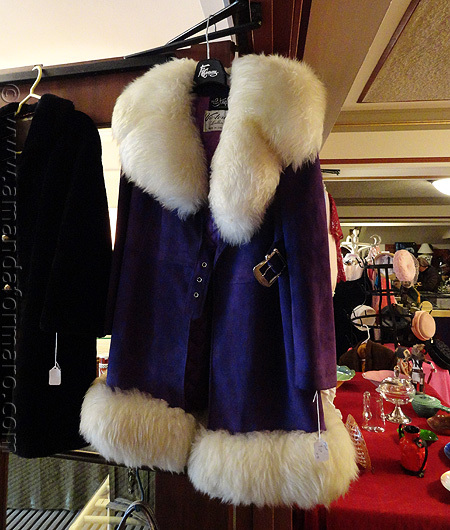 This gorgeous coat was offered by “29 Palms – The Collectors Oasis” out of Rockford, IL. 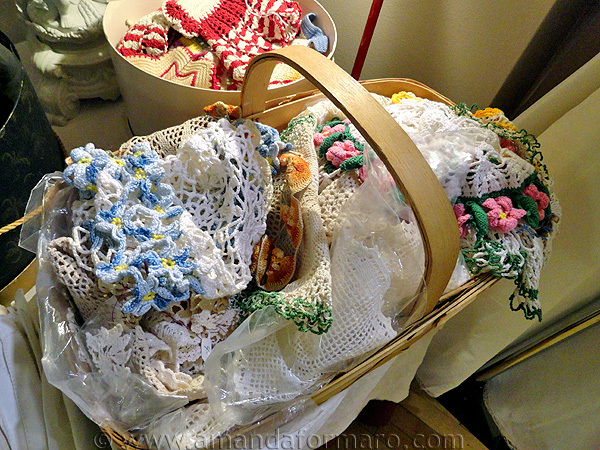 A basket of one of my favorite things… doilies! Vintage ones at that. I’m mad at myself because I meant to go back and buy some before the end of the day and got caught up in everything that I forgot. I’ll have to make another trip and find that vendor again! Oh the jewelry! 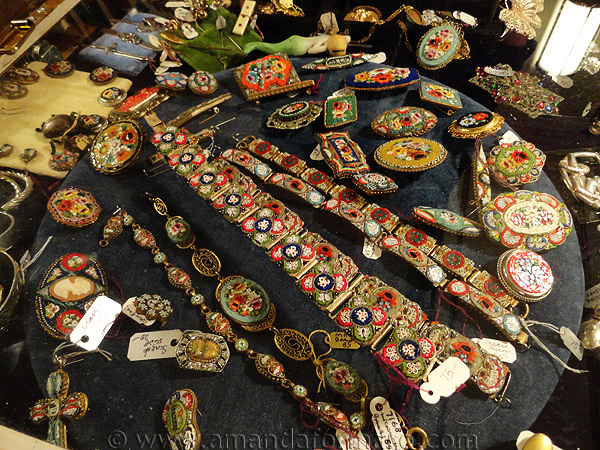 You can’t believe the antique pieces on display, and of course, for sale here. More vintage jewelry than I’ve ever seen in one place. This piece, an Italian micro mosaic tessera was on display in a booth by the vendor “The Way We Were”. 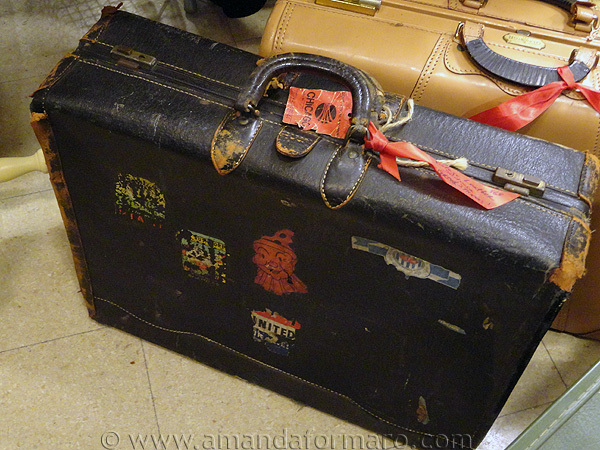 This rough around the edges vintage suitcase has definitely traveled around the block a few times. This piece was offered by “Hello, Good Buys Antiques and Collectibles”. 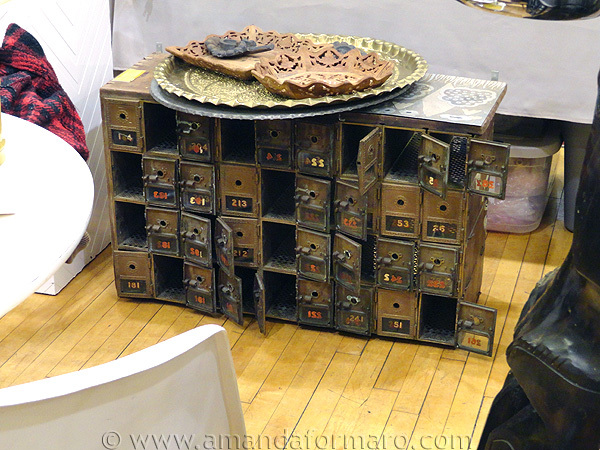 My favorite booth of the day was “Stepbackin Vintage Decor” operated by Sumaya. 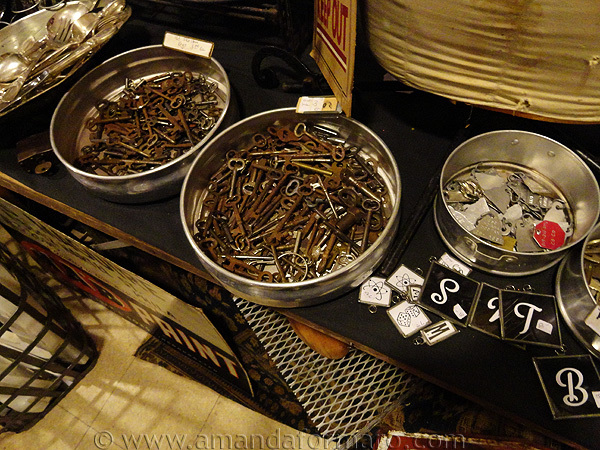 She had not only this huge collection of vintage keys, but galvenized olive baskets, vintage metal letters, old coil springs, tons of things that the DIY junker would appreciate. Finally, I ventured upstairs where I found “Paper Patty”. See that beautiful display above? 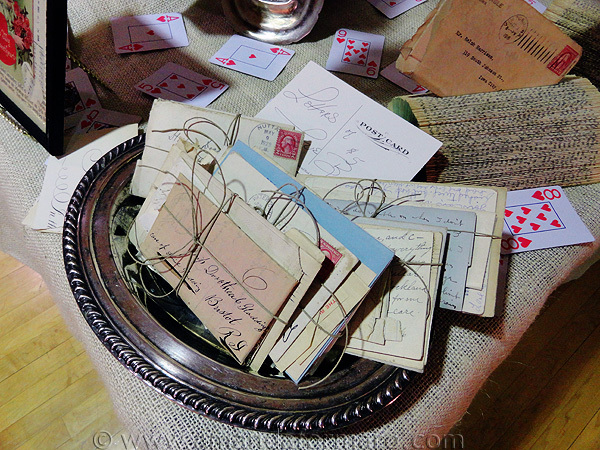 Those are old love letters, bundled together and tied with care. A gorgeous and romantic way to dress up a spare bedroom or mantel. This booth is where Wendy spent a ton of her time. She picked up an old tourist map from Paris and various other vintage book pages. I sifted through the botanical book pages and found three I loved. 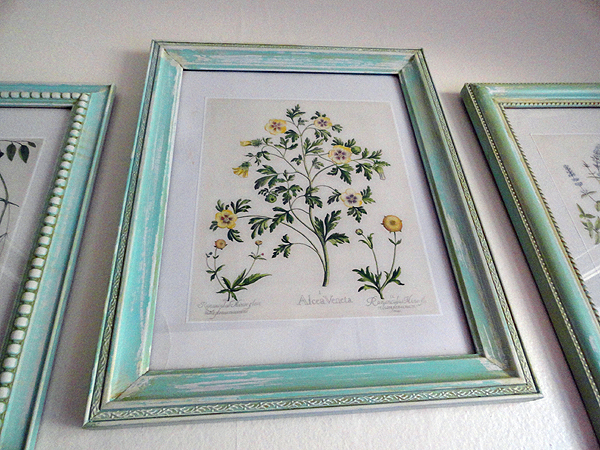 You can see what I did with them here – Aged Frames and Botanical Prints. I can’t end this post without saying something about the amazing empanadas we had for lunch. This booth and a few other food vendors were set up to keep buyers from getting hungry. These empanadas will absolutely delicious, and the perfect size! I had chicken and Wendy had mushroom, but there was a huge list of other options available for only $2.50. We were told that these booth owners started here at the market and have just opened their own restaurant called Empanadus. I need to find that when it opens! We had a great time at The Randolph Street Market and I look forward to visiting more this summer. During the summer season, which runs from May through September, there’s even a free trolley. Who knows, maybe I’ll see you there! Something else you might like if you’re into junking — Funky Junk Interiors: An outdoor vintage market, great junk. I am dying to go to this!! Do these shows continue into the summer months? It looks fab!! Nice! I love vintage jewelry and oo those skeleton keys! I want them all!